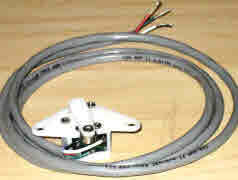 5 wire switch can be used for inboard / outboard electric shift models. Wiring schematic for 3 and 5 wire configurations. 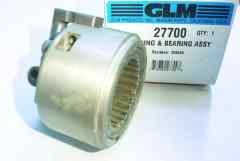 Replaces OEM 379019, 384042, 384006, 383624, 385253, 172123 and 172124. Swivel housing should be removed before installing or removing cable. Note 1978-1979 swivel housings do not have cable cut out and should be undated before installing a new cable. Note 1982-1986 with cut out is showing in picture. P/N 22-510 Used units are sometimes available for years 1978 thru 1981. *Note 1 This can be converted over to use on 1982 thru 1986 installation by simply cutting away the hydraulic cylinder support from old type. *Note 2 Old (1978-1981) cables can not be used for 1982 thru 1986 installations. 400-800 cable for years 1982-1986. There are two OEM numbers 982802 and 982563. Note 1 This cable will have 2 groves at end of the flat area. Note 2 No grove or only one grove on cable is the 1978 (no grove) or 1979 to 1981 (one grove) cable. 400-800 cables all years have flat top on adjustment end. P/N 21715 Cobra cable includes guide tube and set screws. 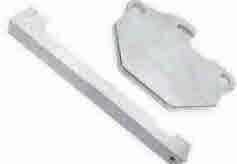 OEM-987661 54 inch long at nuts. Compatible with all models 1986 - 1993 except King Cobra models and 2.3 liter Ford 4 cylinder. Some 5.0 liter Ford 1993 models may have a slightly longer cable. Please measure your cable if you have a 5.0 liter Ford 1993 model. P/N 27720 Detent is assembly upgrade made in 1991. 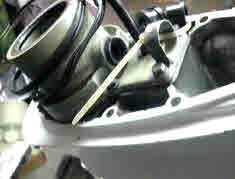 Upgrade as listed below OEM 915954 Will allow rod assembly to find center of forward and reverse location. The old version had 1/8 inch or more play when moving rod in neutral location. This now allows the installer to measure base to top of rod end receiver. This neutral or center reading should be 7-.156 inches or 8 turns. Upgrade has built in tapper lead on both side of detent. 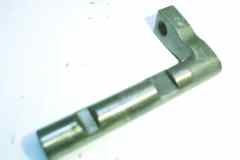 This allows shifter rod to go into forward and reverse gear with about 7 to 10 lbs. Old detent rod was about 15 to 20 lbs to move rod. Modification now places less pressure on cable. Less wear on clutch dog and forward gears as cable sides in and out of gear easier. Cable life expectancy with modification will last longer with 10 lbs less pressure on metal cable when changing gears.